The Grivel Brenta 30 does all the work when it comes to managing all the gear so that the climber can focus solely on summiting the peak. 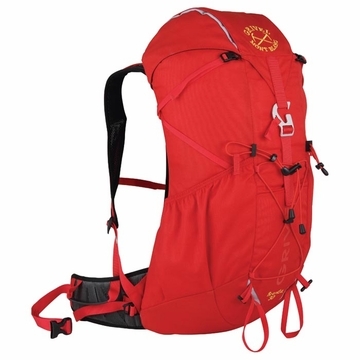 The sturdy Air Tech back panel makes this pack not only light but also highly breathable as it creates a tunnel for air to pass between the back and pack. In colder temps or for more flexibility, the back panel’s support rod can be removed to collapse the air tunnel and provide additional range of motion. The packs breathability continues with the padded and extremely vented shoulder straps and hip-belt. The Brenta is a top loading pack equipped with a drawstring drift collar and a double-pocketed lid. The unique zig-zag compression straps along the sides of the pack truly shrinks the entire bag down to nothing. Carrying a hydration bladder, water bottles, and ice axes with this pack is a breeze with their respective built-in components. The Grivel Brenta is made of lightweight Eco Fabric from 100% recycled materials, i.e., PET bottles and fiber products.